Michele Bartyan became the first International GT Open Champion at Barcelona on Sunday, he and Alessandro Pier Guidi having a perfect race and scoring a perfect maximum of 44 points - as the day fell apart for the other championship contenders. Aicart / Guerrero in the Mosler arrived with a very healthy points lead, but double points for the last race, and some errors on their part, plus the longest pit stop penalty (50 seconds), doomed them to a seventh place finish in the Escuderia Bengala Mosler. A drive-through penalty for pit lane speeding (by Guerrero) was the straw that broke the Mosler team’s back. 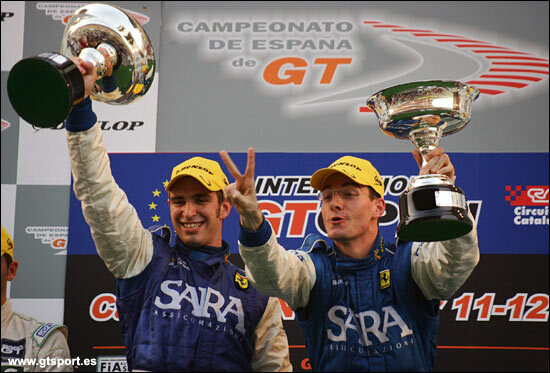 Paolo Ruberti (Edil Cris Ferrari 430) was instructed to pit during the first safety car period, but with so many cars on the track / in the pit lane, that led to the loss of a lap: he and Giammaria finished eighth. “It has been a very stressful season until the end, as we lost our initial advantage during the year, but today everything went perfectly!” said the new champion. 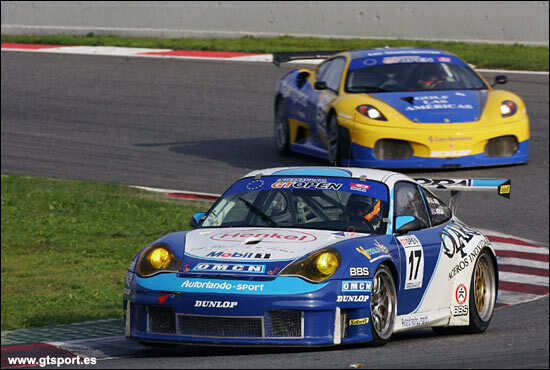 The Ferrari of Maurizio Mediani / Damien Pasini (Victory Engineering) took second place in the race, ahead of the Autorlando Porsche of Gianluca Roda and Johnny Mowlem. 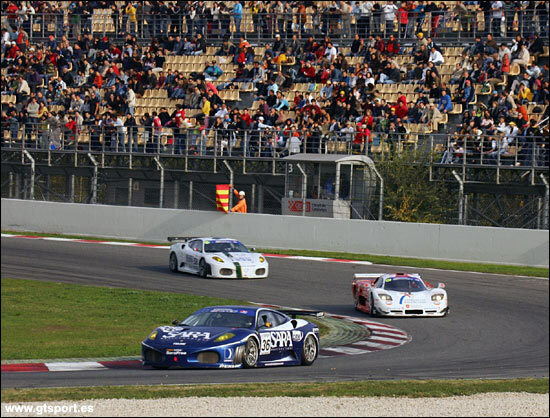 35,000 fans flocked to the Catalunya track, to witness 55 of the 61 cars take the start, on an ideal autumn day in Spain. Pier Guidi, Aicart and Ruberti were the three front-runners at the start, at least once Pasini slipped down to fourth. The first safety car appeared as early as lap four, because Stefano Zonca’s Viper lost its engine, and its oil. There seemed to be plenty of incident throughout the race. Ruberti’s team called him in to get one pit stop out of the way, but a very crowded pit lane delayed him sufficiently to lose him any chance of the title there and then. After the first restart, Pier Guidi led from Aicart, Pasini, Manuel Giao (PlayTeam Ferrari 360) and Roda (one driver change out of the way in the leading Porsche). Guerrero was the first to pit, but incurred that drive through penalty, while Pasini and Pier Guidi stopped without drama on laps 24 and 25. Bartyan was the leader at one hour, so there were 22 points in the bag, and second at this point was Roda in the Autorlando Porsche. The Aicart / Guerrero Mosler was ninth, Ruberti’s Ferrari eleventh. The black flag was shown to five cars (the Sunred Cupra of Valero, the Lamborghini of Piccini, the MC Ferrari of Torres, the Marcos of Nogueira and the Chrzanowski Porsche of Friesacher) for resisting marshals’ orders to leave the track after their cars stopped for various incidents. Pasini was going particularly well at this stage in the Victory Engineering Ferrari 430, taking the lead from Bartyan and Roda, ahead of the second driver change pit stops. As the pit stop penalties took effect, so Pier Guidi retook the lead ahead of Pasini, Mowlem (below), Amaral (DriveX Porsche), Sala (Automobil Club D´Andorra Porsche), Breyner (Galp Porsche), Ruberti and Aicart. On the day, the Bartyan / Guidi Ferrari was the fastest car on the track, and Bartyan it was who vaulted to the top of the points. 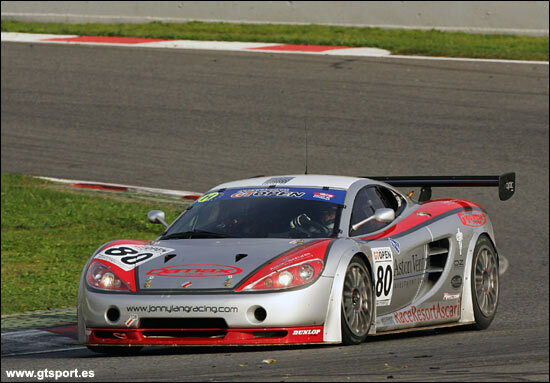 The GTS Class saw victory go to the Damax Ascari of Martin Rich and 2006 British GT Champion Jonny Lang, well clear of the Vipers of Ruffier Racing and Racing Box, while GTB had Alessando Nannini in contention for the class win in Giudici’s Ferrari, but the Italians came home second behind the Marcos Racing International Mantis of Pedro Nevoa and Fred Van Putten. 10 Belicchi / Zonca, 69, etc.